Although practically every homestead had a milch cow or two early on, dairying soon became a significant element in the agricultural economy of San Juan County. 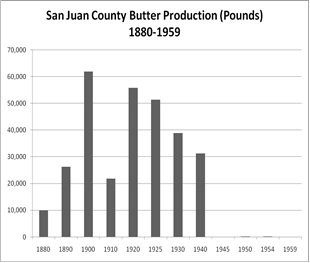 The number of dairy cattle county-wide gradually rose from 247 in 1880 to 443 in 1890, 774 in 1900, 1,916 in 1910, and 3,175 in 1920. 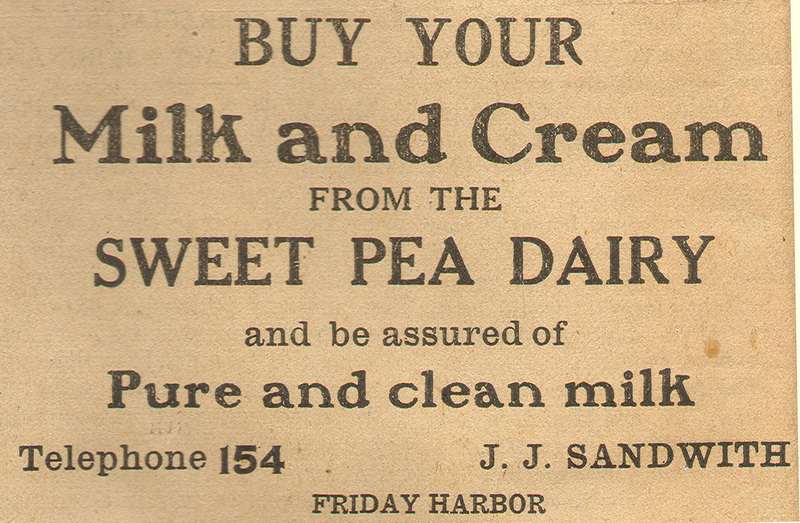 Increased dairy production in turn led to the establishment of a creamery in Friday Harbor in 1901. Three years later, the local newspaper reported that 3,000 pounds of cream had been converted to 1,000 pounds of butter in one day, and that the creamery was so busy it had to introduce a night shift to run 24 hours a day. By 1907, the creamery produced 120 tons of butter annually. With the introduction of the first county agent in 1921, there was a big push to improve stock through selective breeding, animal health through tuberculosis testing, and production through cream content testing. The formation of the San Juan County Dairyman’s Association in 1924 helped this movement by providing a forum for farmers to discuss improvements. Average dairy herd for SJC farmers? Average production of milk? ( in 1920, average daily milk per cow was 543 gallons) From 1920 to 1940, yearly milk production in the islands averaged over 1 million gallons. State regulations regarding dairy production led to changes in farmstead and building design. In 1895, a “Law Relating to Dairy Products” was passed, which mandated the labeling and dating of butter and established the State Food and Dairy Commissioner. Following World War I, major legislation was passed in 1919 to regulate dairy layout: it mandated clean water, sanitary equipment, whitewashed areas, and a milk house separated fifty feet from any filth. This led to the construction of clean, whitewashed stalls and stanchions with gutters for flushing manure and urine out of the barn. Separate milk houses were also built, and, after the introduction of concrete, troughs were constructed to hold cold water in which the ten-gallon milk cans were kept cool. 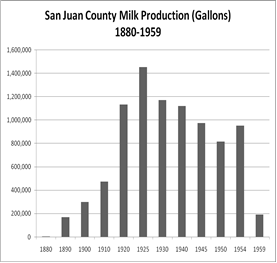 Technological changes also affected San Juan County dairying. The introduction around the turn of the century of the Babcock Tester, which measured the butterfat content of the milk from each cow, enabled dairymen to improve their stock selectively. Around the same time, Gustaf de Laval invented the centrifugal home separator, which enabled the individual farmer to separate the cream on the farm. Mechanical milking machines, which had been invented as early as 1875, became available in the region in the 1910s. All of these helped the farmer improve their stock and production. In 1949, the state legislature passed the “Fluid Milk Law” (Grade A Milk Ordinance). Causes for decline in dairy industry in SJC??? 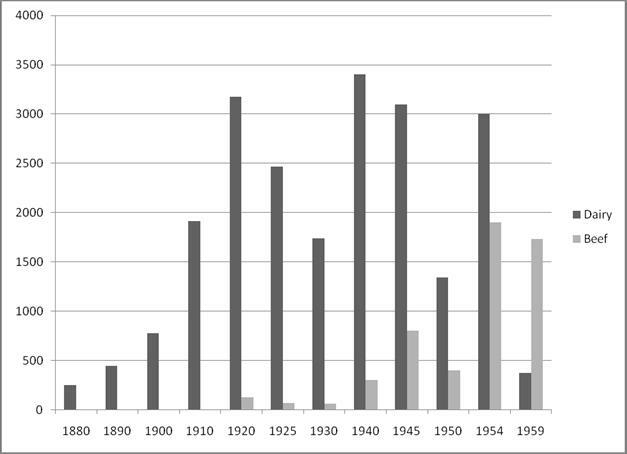 Dairy cattle, some 3,000 strong in 1954, declined to 372 just five years later. The creamery in Friday Harbor closed in 1962. During the same period, beef cattle–less labor-intensive–rose from 400 in 1950 to almost 2,000 four years later, and have fluctuated from 1,200 to 2,000 plus during the years since then. Dairying was intense farming, and for smaller operations of from 6-7 cows, women did most of the work of milking, feeding, and cleaning separation equipment. For operations of 20 animals or more, everyone ‘leant a hand’, including the man and woman in a household along with their working age children. It has been estimated that some 20 tons of milk, feed, bedding, and manure per cow per year were moved, requiring some 60-150 ‘man-hours’, depending on the efficiency of the operation. Therefore, the more efficient the design of the barn, the less labor was expended on the dairy operation. In general, the desirable attributes of a dairy barn included siting on firm, well drained ground; proximity to other structures (such as the milk house) for convenience, yet distant enough in case of fire; convenient access to yards and pasture; and ample feed and bedding storage. Some handbooks advised the lengthwise orientation of dairy be north/south, to afford maximum exposure to sunlight, as well as ‘bank barns’, which were built into sloping ground in order to take advantage of the difference in elevation to access different levels of the structure. In early twentieth-century, modern or ‘scientific’ designs for dairy barns, the optimum width was determined to be around 36 feet, which allowed for two rows of stalls with alleys, illuminated by light on both sides, on the ground floor. The full second story was occupied by the hay loft, expanded because of the greater volume afforded through a gambrel, gothic, or bow shaped roof. Pre-electricity, both natural lighting and ventilation were important factors. Some experts advised 4-6 square feet of window per cow; others simply suggested one window for each animal. Dairy cattle were brought into barns twice a day for milking. To accommodate this, sheds were built abutting the hay mows, with stalls and stanchions lined up in a row. (In 1912 the Journal reported that Joe Groll had completed a new cow barn for Mrs. H.C. Smith near Kanaka Bay: “The building is 40 by 70 feet and is arranged with patented stalls, which enables a person to care for the cows in every particular, without one interfering with the other.”) A typical stall included an alley or walkway for carrying feed to the mangers, the manger itself, the stanchion for holding the milch cow in place while it was being milked, a platform for the animal to stand on, and then another alley or walkway with a gutter or trough for the manure that the cow dropped while there. The material for these elements was predominantly wood. The stanchions often consisted of an upright 2x fixed top and bottom to rails, with a pivoting 2x pinned to the bottom rail 7” or so away; when the cow’s head entered into the space between the boards, the moving member was pivoted toward the fixed member and held in place by a notched swivel on top, thus ‘locking’ the animal’s head in place (see diagram or photo). Platforms were constructed of thick (2” or more) planks to hold up to hoof wear. All wall and ceiling surfaces were whitewashed with a lime solution. Vacuum systems were often used for milking; these consisted of pumps, pipelines running along top of the stanchions, and spigots for attaching the hoses to the milkers. The De Laval Company, named after the eponymous inventor of a patented mechanical separator, made this and other systems. Another innovation was the manure trolley, or bucket that hung from an overhead tack running along the back of the stalls and out into the barnyard, where the manure could be dumped into piles or carts for hauling elsewhere.